Here is an interesting convergence. The Evangelical community of Kenya and scientists, both oppose the display of Turkana boy, the remains of a 12 year-old prehuman ancestor who died roughly 1.5 million years ago. The reasons are of course completely different. Bishop Boniface Adoyo, the head of the 35 Kenyan evangelical denominations, is leading opposition to the exhibition. “I do not dispute that as humans we have a history, but my family most certainly did not descend from the apes,” he said. The bishop was invited to view the new Human Origins gallery before it opened this month, and said that he would call on his flock to demonstrate outside the museum if evolution was described as anything other than merely a theory. Yes, merely a theory that is the backbone of modern biology and is accepted as much as merely the thoery of gravity. Lining up against the evangelical movement is the country’s most famous fossil-hunting family. Much of the museum’s collection is based on finds made by his parents, Louis and Mary Leakey, in the 1920s. Dr Leakey has his own concerns about displaying the skeleton, arguing that it would prevent access for scientists, who still have a lot to learn from Turkana Boy. When Ethiopian officials announced plans last year to send the famous human ancestor "Lucy" to the Houston Museum of Natural Science in Texas, many paleoanthropologists were furious at the risk to an irreplaceable specimen. The late F. Clark Howell of the University of California, Berkeley, predicted that Lucy's journey would "start an avalanche" of exhibits of original hominid fossils. 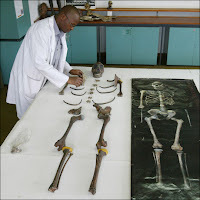 Last week, Howell's remark began to seem prescient: Officials at the National Museums of Kenya announced government approval for their plans to send Nariokotome Boy, the partial skeleton of a 12-year-old, to The Field Museum in Chicago, Illinois. The 1.5 million-year-old fossil, the most complete skeleton of Homo erectus found, continues to be a source of scientific data, and many researchers are angry at the news. A traveling exhibit is "prostitution" of the fossils, charges Kenyan paleoanthropologist Richard Leakey, whose team discovered the skeleton in 1984. Perhaps its a good idea to keep Turkana Boy rest in peace for research and avoid both controversies.